My brother is a fresh water fly fisherman. He's expert at catching trout. I remember when we were kids he and Dad would fish together during our annual camping trips up North. I'd tag along, but do not much else than bait a few hooks & futz around in the tackle box. The tackle box, my brother recently told me, had been Grandpa's. When my brother was little, Grandpa had given it to him. I had always assumed it was Dad's. 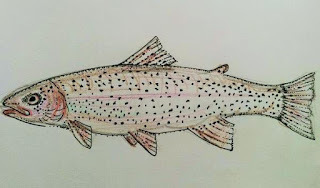 I drew this trout with my brother's passion for fishing in mind and sent him the image via email. He said he really liked it. Now that I'm back home in the Bay Area, then I guess I could just give it to him. -must clean up some of the pencil lines first! And that is undeniably a rainbow trout. As a child we followed my father along the river bank with a frypan. When he caught was when we ate. Fine drawing Bea. I just talked to a man from Idaho, wintering in OK, with a shopping basket full or books and lures for fly fishing. I didn't have any in my booth, but I wish I had. Nice! Dad tried to get me into fishing as a kid, but sadly my attention span was (and still is) far too short. Your comment about your mom and the mascara... I really hope you never ever feel like you were overreacting by getting upset over it. I think maybe our mothers went to the same parenting school. Thanks, Mich. I did wonder why I had had such a strong reaction after all this time (I'm 45 years old, gosh darn it!). And I wondered how I could have avoided feeling so poorly. On a related note, I have yet to find a decent therapist in my area. My therapist is called Dr. Xanax, and he is a miracle worker.